European-style heated treatment turns your haircut into a wellness visit. Sun, pollution, chemicals, and mechanical stress cause damage to the hair. With HotCut, the hair ends are sealed by heated blades. This offers better protection from detrimental impact. More volume, shine, bounce and elasticity. After a few cuts, split ends will disappear. How hot is the HotCut system? Temperature is adjustable, and controlled by your stylist. It ranges from 230-338 degrees Farenheit. Can I be burned or shocked during my haircut? No. The handle and blade are well-insulated. The system operates on a low-voltage tension (7 volts). Will the heat damage my hair further? No. We adjust the heat to your hair type. You’re more likely to get damage from a hair dryer or curling iron than from HotCut. 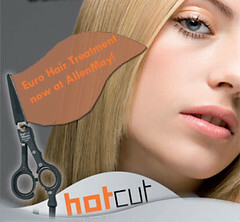 1 Reply to "Exclusive to AllenMay Salon - HotCut for Damaged Hair!" I have been a customer of Allen May for 10 years. Not only do I get loads of compliments on my style and color, I just love coming to this salon. Very personal, attentive and the experience is relaxing. The staff is very competent. You will not be disappointed.